Over the years I have been running and writing, I have been asked these 3 questions the most. With a positive attitude, most anything is possible. My only goal this year was to make it better than last year. It really should be everyone’s goal each day for this. Make today better than yesterday. Sometimes though, life can get overwhelming and it comes down to make this hour better than the last hour. Perspective is a tricky thing to master. About the 3 days before the race, I had a slight panic attack about my nutrition plan. I didn’t think I had a way to intake enough calories. Granted, I have been training my body for the more metabolic efficiency method of focusing on fat fuel. While that all made sense to me, I couldn’t wrap my brain around it fully and wanted a backup plan. I went to Richard who is the Colfax Marathon Ambassador Manager and Personal Trainer and Ironman and on and on (he knows some things), and asked what he fuels with. He pointed me to EnduroBites. These gluten free bars come in 4 squares and each square has 100 calories. Lately in our house, we have been doing more and more gluten free. I’ll be damn that removing gluten from the diet actually makes a difference in how my body feels, higher energy levels, and better recovery time. I was sold on the Endurobites. Now it’s 3 days before a race which means no time to get these bars shipped to me. I reached out to Mitch to see if he could stop by a store in south Denver to pick up a few. It worked out that he needed something there so all was good. Now if you’re a new runner, don’t do any of this. I met Mitch at the starting line, 16 minutes before the start, to get these bars from him. I had never seen or tried these things. Figured out where to put them in my pack for easy access, commented on how tasty they look, and lined up at the start. All against number 1 rule of don’t do anything new on race day. Welcome to my world. Many people ask if I carbo load for races … in other words, do I eat a giant plate of pasta the night before a race. I do not. That stuff makes me sleepy. For this race I tried something new (I know, blasphemy). 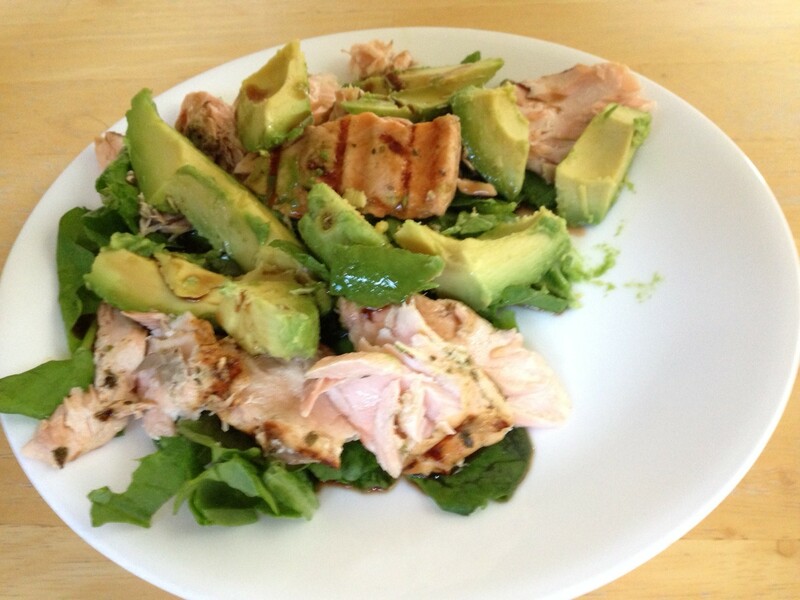 I created a salmon and avocado spinach salad with balsamic vinegar. The salmon was easy to make as I marinated it in some lemon juice and herbs while heating up the George Foreman Grill. If you don’t have one of these grills, get one. They have inserts to make waffles, paninis, and more. 6 minutes later and I had salmon falling apart at the touch. I was happy to see my 5 year old devouring the salmon as well! Early morning wake-up call. Many people I knew spent the night in Leadville while I drove up morning of. I could fill a post with my schedule of why I didn’t go the day before, but I don’t want to wear you out too quickly. Got up at 3:30am, made a spinach omlette with side of avocado and fruit. Put on the gear and headed out to pick up Derek. 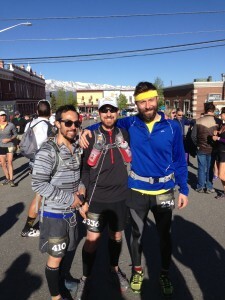 You may remember him from last year when he did his first half marathon this same weekend in Leadville. 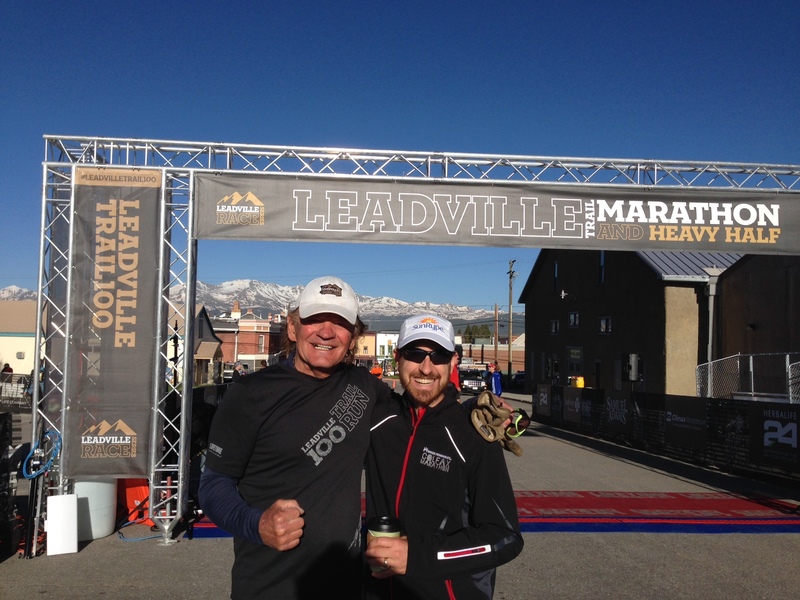 He let me know a couple months ago he had signed up for his marathon: Leadville. Talk about going after it! Completing your first marathon is a big deal, but doing it on one of the hardest courses in the country is another level of respect. I picked up Derek at 4:30am and we started the drive. We chatted about technology, family, design, coding, running, and nutrition all the way up the mountain. We parked in the same spot as last year and grabbed our packets. 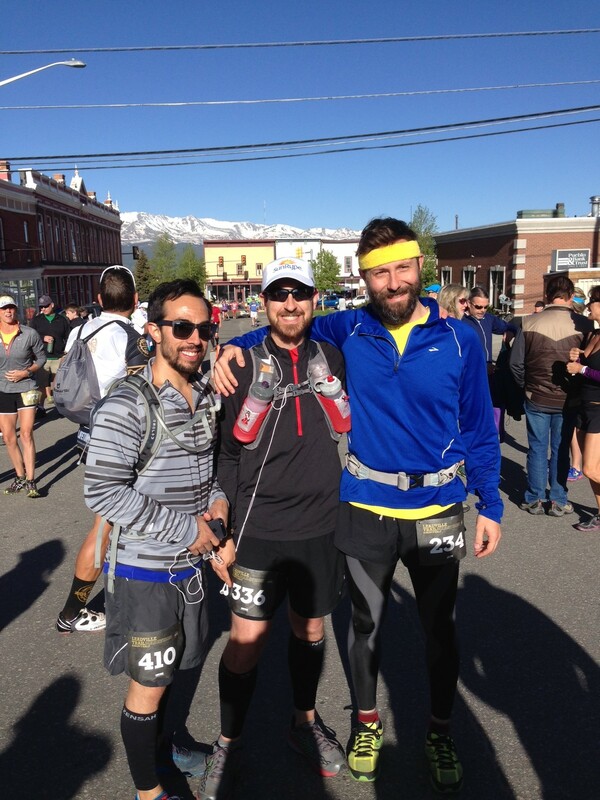 We ran into Jamie and walked towards the start line. He headed back up to the Leadville Hostel to grab his stuff and we went to grab a coffee. From there, walked over and saw the house we are renting for the Leadville 100 (2 blocks from the start line!) and then back to the start area. There we found Ken Chlouber, Leadville 100 founder, chatting with people. I went over to chat and Derek took a photo of us. Ken said it was windy at the top of Mosquito Pass so bring a jacket. I hadn’t planned on it, but thought he knew better. He was right. People were starting to line up. I was chit chatting with bunches of people and hearing whispers that there was a course change. Sounded like we weren’t going the usual way over Ball Mountain due to snow. Yes, mid-June and course being changed due to snow. 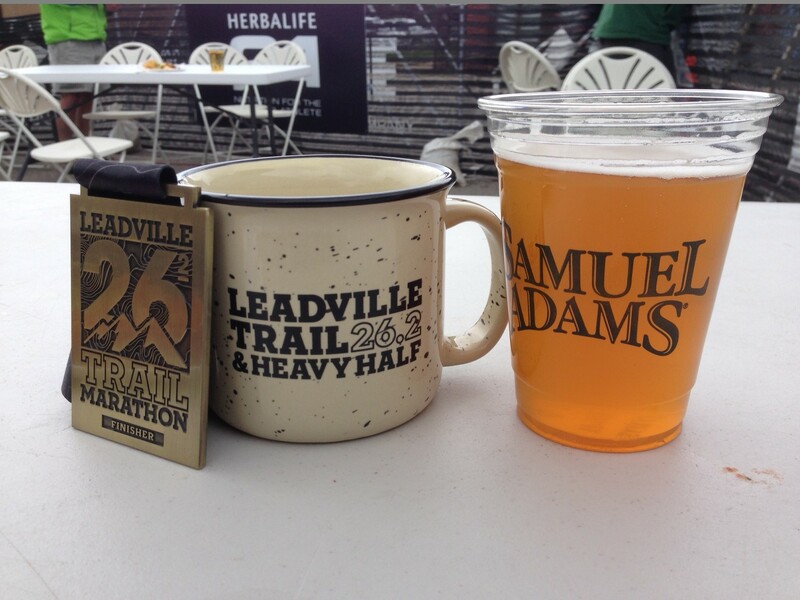 Welcome to Leadville! The plan was to keep moving forward and be in the moment. Also, curious to see how far into the first mile I could run before walking. Of the first 6 miles to the aid station, 5 of them are uphill. Nice slap to the brain when you’re starting a “race” and you’re already walking. Little chit chatting happens starting around mile 1.5. People are just trying to breathe. Up until that point I did have some short chats. 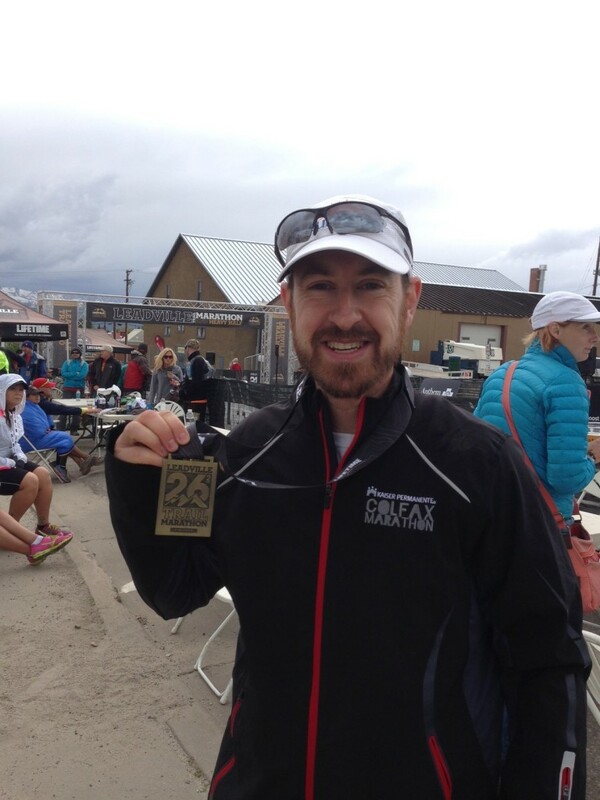 Talked with Mitch about his upcoming crewing at Western States and Colfax Marathon topics. At each smaller hill, I did a little jog. The only way to get better at hills is to run more of them. What better place to do that than during a race? After all, they have medical staff should I do something stupid again. Around this point I was still doing fine. Drinking water, staying in the moment, enjoying the views, and wondering when the climbing would stop. Of course I knew the climbing wouldn’t really stop until mile 25. I caught up with a guy that come to find out, had completed the 100 course a few times. We did an analysis of why I had failed my previous 2 attempts. I already knew why because my brain is in a constant state of evaluation. I’m always looking for constant improvement and after last year’s Leadville fail, I had spent many many hours reflecting on why. 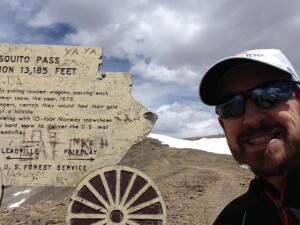 He didn’t provide much new advice except the normal train more altitude, eat food, and keep moving forward. Yup, learned all that and then beat it into myself the hard way. I had run with a guy that just drove in from St. Louis a few hours before the start of the race. Even I was like “woah that’s rough.” Talk about needing to adjust to elevation quickly. That impacts your fluid and fuel intake dramatically. He seemed to be doing well. At the aid station he went on ahead as we started the climb. I was mentally preparing myself for an hour plus walk climbing 3,000 feet. In some ways I was envious that he didn’t know better, but also have felt the pain of this climb. I wanted to see how few times I could stop forward motion going up. About a third of the way up, I gave a hey to Courtney who was on her way down. I caught myself saying how I wish I could run like her and some of the others that were coming down the Pass already. Then reminded myself we all have different schedules, lives, and commitments. I was here and now, make the most of the moment. Curtis: My legs are locking up and making it impossible to move. Me: You’re all good. This 20mph cold breeze is reducing the inflammation in your legs so it’ll be fine! Curtis: You know what? I think you’re right! It’s working! Dude finished the race ahead of me. In ultras and in life, remember that this too shall pass. I don’t have a lot of photos from this race. I wanted to enjoy the views, people, and the running. It was a pre-planned goal to get to the halfway point, take a selfie in front of the sign, and head back down the mountain. Check. I ran into Meaghan and she came right up to me to let me know what happened to Mitch. Around mile 7 he rolled his ankle. Pretty bad that swelling started quickly. In a road marathon, you can step off the course onto a sidewalk and call someone. Not on the trail. You need to get to an aid station. Calling someone? You might be lucky enough to have cell reception. Then I turned around and Derek came straight up to me. Derek: I am so happy to see you. Me: Hey! You are rocking it! Derek: I’m not sure how much farther I can go. Me: Well there’s no helicopter coming for you. Only way back down is on your feet. Derek: Ok. If you run, I will follow. This helped me run more and got us moving pretty fast. Coming down the mountain was first patches of snow, then patches of mud from the melting snow, and then small rivers covering the trail. I started bouncing side-to-side on the trail like I was running the quintuplet steps on the Amerian Ninja Warrior course. If you don’t know what that is, find it, and watch it. Came into the aid station and volunteer filled my water bottle. Volunteer: Anything else you need? Me: Do you take tips? Volunteer: Your smile is the only tip I need. For me, it’s all about having fun and being in the moment. This volunteer got it. Here I am trying to make a joke and I get one-upped right back at me. That is what I love about this community! Quick math told us 9 miles and over 3 hours until course cutoff. We knew there was some good climbing ahead, but nothing like what we just did. Any downhills we were going to fly. And we did! There were a some miles that were 10 minutes and then climbing closer to 19 minutes. We knew we were getting close though and could start the countdown of the number of climbs. Not to mention, we were passing people. That’s a bit of help to the ego. I went over and chatted with a volunteer while Derek made a pit stop. There was a runner wrapped in a blanket behind her. Me: Does he have hypothermia? Me: Does he know the way to cure that is to run downhill to the finish line? Volunteer: He has a headache and nausea. Me: Well that just sounds normal. Onward and downward! About a mile down, I stopped for a pit stop. I was pretty excited about the color and thought about how nice it was to get hydration figured out. For me, it was the last piece of the puzzle. Now time to put it all together and make it happen! Me: So I have to tell you, in case I collapse, that I have been seeing blurry every 5 minutes or so. It just kind of hits me along with a headache. Not sure what that means. Half a mile later I stop in the middle of a full on run. Was in the middle of singing when dry heaves kicked in. First thought was that there was nothing to come out and second thought was “what the hell?” Derek looked concerned. I have no idea where that came from. Sipped some water and time to run to the finish. It was commented after that I had the biggest smile on my face when I crossed that finish line. 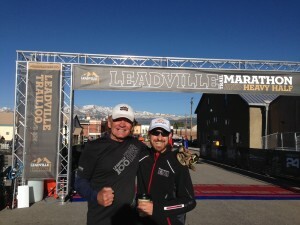 I am so psyched that Derek finished his first marathon and in Leadville no less. We greeted Jamie and swapped stories briefly. Then it was time for food and Sam Adams beer! It was a pretty fantastic day on the mountains of Leadville. I am really excited that it seems like I have the nutrition figured out so there will not be another visit to the ER … for that at least. 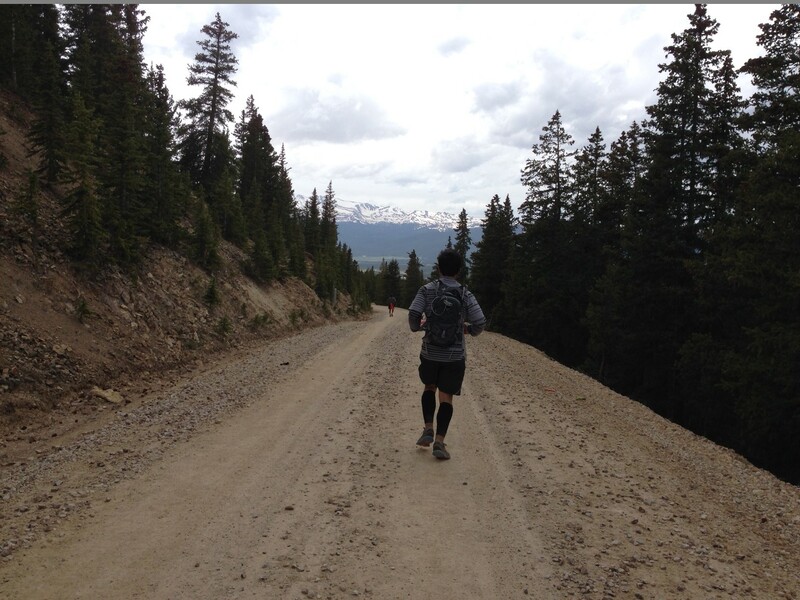 Few weeks to rest and train for Silver Rush 50!